In today’s day and time, what with the multitude of career options, serious competition for entry into colleges and courses, there is a great demand for professional career counselors who will reduce the ever increasing stress on students by helping them choose the right career. Let us understand what being a career counselor involves. Let us begin with the basics. What does one have to do to become a career counselor? A career counselor needs to have at least a Masters degree in Psychology (with a specialization in Counseling) to become a successful professional in the field. Counseling, in general, can be in a wide variety of fields such as hospitals, schools, correctional homes, for children with special needs etc. To be a career counselor, one will also need to have exposure to psychometric testing. So to start off, you will need to choose the Humanities/Arts stream in Class 11 and go on to do a Bachelor’s in Psychology. In your M.A, you can choose to specialize in Counseling. There are a number of certification and diploma courses that one can pursue after a post-graduation in psychology to enhance one’s prospects in the field. Alternatively one can do 12th with any stream and after 12th can switch to psychology. Any graduate with aptitude and personality for Counselling can also go for PG Diploma in Guidance and Counselling and can join in this career. What does a career counselor actually do? A career counselor conducts aptitude tests to help determine the most appropriate field that you should be choosing on the basis of your inherent abilities. This battery of tests helps the career counselor to narrow down the aptitude areas where your strength lies and suggest fields accordingly. Along with an aptitude test the career counselor will also conduct a personality test to determine your personality type. Armed with this knowledge, on your personality traits and aptitude, arrived at through a scientific process, the career counselor is in a position to make informed suggestions about possible career options. But it does not end at that. The career counselor also helps you understand the growth prospects in the career you will choose for yourself, courses that you can pursue, the financial implications of it, if and how to prepare for entrance examinations to such courses/careers etc. If you wish to explore the possibility of studying in foreign universities or if your course of study is best offered by a foreign university, the counselor will also help you prepare documents and give qualifying exams for the same. What does it take to be a successful career counselor? A career counselor, along with being professionally qualified, needs to have an endearing personality – the kind of personality that people feel comfortable with and can easily open up to. Secondly, the counselor needs to be up-to-date with the latest courses, advancements and growth prospects in all fields possible or must have good researching abilities, so as to be able to provide correct and relevant information on careers. This will also require good networking skills – having a database of and being in constant touch with professionals from a wide range of fields so as to be able to provide the student/counseled with a realistic picture of the career prospects based on current day scenario. Where can I find a job as a career counselor? An increased awareness on the need to choose the right career path early on in one’s academic life has led to a tremendous increase in the importance of the career counselor. There are so many career options to choose from that one cannot help but be spoilt for choice and totally befuddled on what to choose. So what does it mean for you? As a future career counselor, it means more job opportunities for you. A number of schools have a career counselor to help students scientifically identify their aptitude and choose the correct stream right from the beginning. Just like schools big universities and reputed colleges have counselors to help students choose from the courses and also after finishing the course these counselors help to know which jobs/ higher studies options are more suitable. 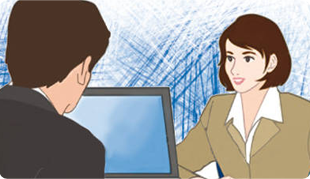 You can be part of institutes that offer online career counseling advice. The process begins with an online aptitude test and personality mapping. On the basis of the scores, the individual is provided with a detailed analysis of the best suited career options. As a career counselor with such agencies, you will be expected to administer the tests, provide a detailed analysis on the basis of the individual’s scores and provide career options. You will also need to help the individual with courses that he/she can do, institutes that offer them, the finances involved and the growth trajectory in the chosen career path. There are several specialized counseling institutes that help students prepare for foreign universities. As a counselor with such institutes, you will be expected to help the student choose the appropriate university, help in securing grants/loans, prepare documentation for applications, prepare for visa interviews etc. All leading newspapers have a weekly, if not daily, section dedicated to careers and information on latest courses. Either full time or part time, you can write columns in these sections answering career queries of readers. All the above mentioned options seem to suggest that all individuals will come to a career counselor at the right time and all that the counselor will have to do is suggest the right option. But it may so happen that an individual may come to the counselor at a time when he/she has already chosen a career path/has spent a considerable amount of time in a particular field and later realizes that it may not be well suited. Such an individual is at a very precarious stage in life, often with low self-esteem and uncertainty looming large ahead of them. The counselor needs to be able to handle such a situation very delicately. Along with helping the person get on the right track, the counselor will also need to make sure that s/he uses the experience the individual has gained so far to leverage her/his prospects in the career ahead. With the increasing need for choosing the right career early on in life, a career counselor will find her/him self in a number of other settings apart from the ones mentioned above.